This Pittsburgh Mercedes Limo Bus is a 12 Passenger luxurious dream. This is truly one comfortable limousine bus for all occasions (corporate, wedding transportation, casino, prom, conventions, sports events). 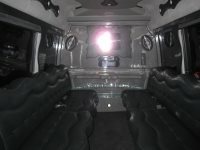 Rent this Mercedes limo bus in Pittsburgh, Washington County, Westmoreland County and Wheeling, WV. 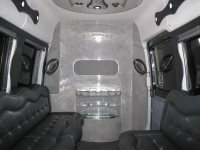 It comes complete with all of the features that we expect from a Mercedes Benz Limousine Bus; plenty of leg room, leather seating, wet bar, flat screen television and immaculate interior. Use this limo bus as corporate by day; turn on the lights, extend the bar and reveal the television by night. This is the perfect all purpose limousine.